For more than 20 years, Dr. Kogan and her team have been taking care of smiles in and around Westport. Her reputation is impeccable, and the word has spread. 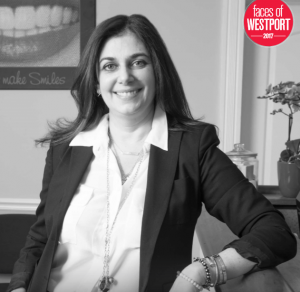 Recently, Dr. Kogan was featured in Faces of Westport section of May 2017 issue of Westport Magazine (© 2017 Moffly Media). Dr. Kogan offers a comprehensive menu of dental services so she can care for smiles at all ages of development. Whether the patient is you, your child or an aging relative that you care for, Dr. Kogan and her staff strive to first and foremost make sure a smile is as healthy as it can be. Studies show that a healthy smile is not only a more attractive smile, but also plays an influential role in overall well-being. With this in mind, we encourage all of our patients to schedule biannual dental cleanings and exams. At these regularly schedule visits, the hygienist will thoroughly clean your teeth, removing plaque and tartar. This is where bacteria hide and if not cleared away this can lead to a periodontal disease, a bacterial infection that affects gums, bone, teeth and overall health. At each checkup, the hygienist and Dr. Kogan will carefully examine the integrity of each tooth, looking for signs of decay, cracking, or other types of damage. Although regular brushing and flossing at home along with dental checkups go along way toward preventing these problems, if they do occur we have the restorative care necessary to repair or rebuild a tooth. Cavities are the most common dental condition. For most of these, Dr. Kogan recommends a tooth-colored filling. No one but you and your Westport dentist will ever know that you’ve had a tooth repaired because the composite resin material blends seamlessly with your natural tooth color. In addition to ensuring the health of your teeth, Dr. Kogan also wants you to enjoy a smile that is beautiful. An attractive smile speaks to people you meet everyday and helps you feel more confident, too. The Dental Center of Westport offers both in-office and take-home teeth whitening as well as porcelain veneers and cosmetic bonding. Speak to Dr. Kogan about any of these smile-enhancing services the next time you are in the office. Dr. Kogan and her team would be glad to welcome you and your family to our comprehensive dental practice. Call our office today to schedule an appointment.